1. Which of the following is the true news story that is the basis for this cartoon? 2. What was the G8? 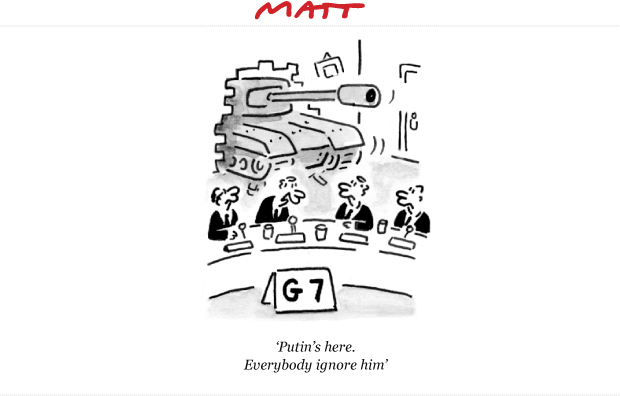 When did it become the G8? Why is it the G7 again? 2. What was the G8? Why was it the G7; when did it become the G8? Why is it the G7 again? The Group of Eight (G8) was the name of a forum for the governments of a group of eight leading industrialised countries (the U.S., Canada, France, Germany, Italy, Japan, Russia and the United Kingdom). Together, these countries represent about 65% of the world economy. The group’s activities include year-round conferences and policy research, culminating with an annual summit meeting attended by the heads of government of the member states. The forum originated with a 1975 summit hosted by France that brought together representatives of six governments: France,West Germany, Italy, Japan, the United Kingdom, and the United States, thus leading to the name Group of Six or G6. The summit became known as the Group of Seven or G7 the following year with the addition of Canada. The G7 is composed of the seven wealthiest developed countries on Earth (by national net wealth or by GDP), and it remained active even during the period of the G8. Russia was added to the group from 1998 to 2014, which then became known as the G8. The European Union is represented within the G8 but could not host or chair summits.